★★★★★ I have regretfully come to the conclusion that I can't play my old record albums forever, so lately I have been getting the CD counterparts for my old vinyl. My latest is Queens Greatest Hits 1 & 2. This is a 2 CD set with a total of 34 songs. The first thing that I liked about the set is that it spreads the better songs around. It doesn't jam them all on one disc, so that the second one never gets played. I had almost forgotten what great music these guys produced, and to hear it on CD is most wonderful. In particular the song Bohemian Rhapsody is beyond music. It is art. Art is the only way to properly state the essence of that music. If you are trying to decide if you should buy this CD or not, then think no more. While I will never lose the romance with all of my vinyl, getting this CD was a move worth making. 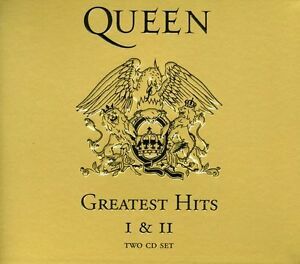 ★★★★★ Queen's greatest hits was my wife's favorite CD.... well, was until it got stuck in our car's CD player!! Honda said they would send it back when they removed it, that was 2 months ago!! Contacted them and they said they would check it out... so, I bought one on ebay!! Now Honda is slow but not ebay. Was shipped and in no time had it playing in the new Honda CD player (it was kinda scary putting it into the player at first). Wife love's her Queen CD's but the jury is still out on the Honda radio. Queen still rocks! ★★★★★ Now, I feel my collection of Queen's music is complete! This CD has the (what I think is) the complete collection of Queen. It's the music you've heard all of your life and know every note. You can sing along with it easily. I bought it because I had some of the music on LP's, but now I can listen to it while I'm shopping on ebay with my laptop. I decided to buy it on ebay because the price was right, the timing was right, and I didn't have to leave my house to get it!!! ★★★★★ This cd set is filled with all of queens greatness. Makes me happy every time I listen to it which right now is every day. Love you Freddie!! !